When I was training to be an elementary teacher, constructivism was the word of the day. Student choice was supposed to inform every learning decision. In theory, it sounded great. In practice? Let's just say that my fellow students and I were very puzzled about implementation and about how a classroom would look if 25 kids were all doing their own thing. I met Dr. D at an observation opportunity I had at the attached elementary school, and I asked him about it. He smiled knowingly and said, "You tell those kids that they can have anything in the world they want for breakfast.Then you ask them if they want Wheaties or Cheerios." Limits on expansive creativity can be a good thing. 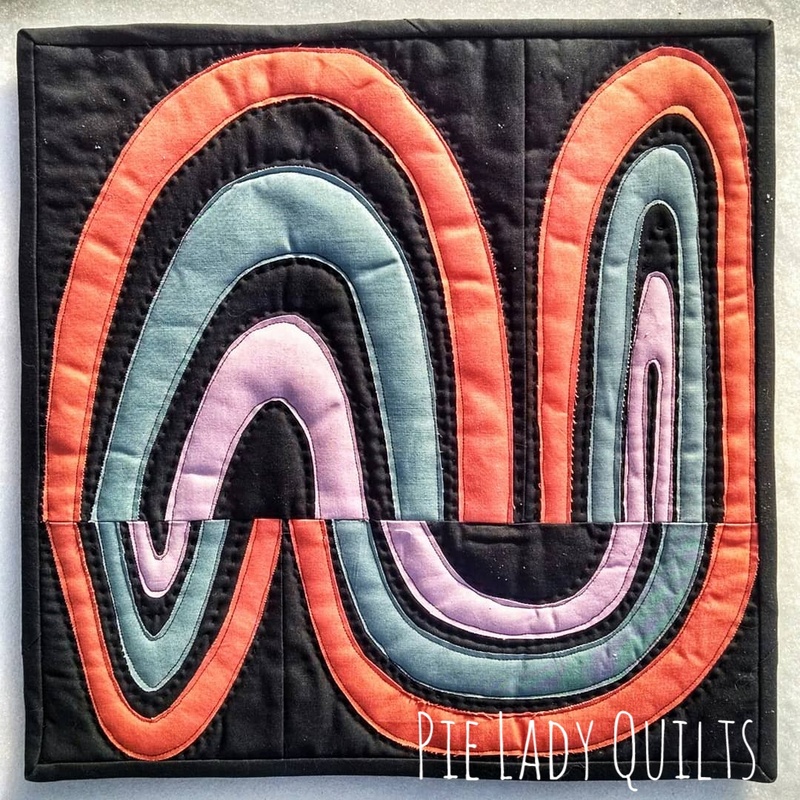 I'd like to share some quilts I've made recently with limits. The first quilt was made for the Project Quilting prompt of "Red, White and Blue." I have a mound of worn out jeans from my two boys that I have saved to make quilts with. I've never gotten to it because I've been worried about quilting over the thick seams. 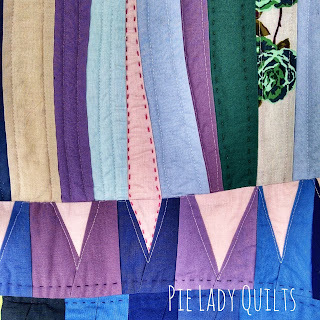 I had the thought recently that I should try a quilt-as-you-go method to simultaneously deal with quilting and bulk. I tried it with this quilt and it worked. The manufacturer directions for the batting I used specified that quilting could be up to 4" apart. I used hand quilting to add interest and secure any area that was getting close to that number. The fun part about using the quilt-as-you-go method was that there was no going back. 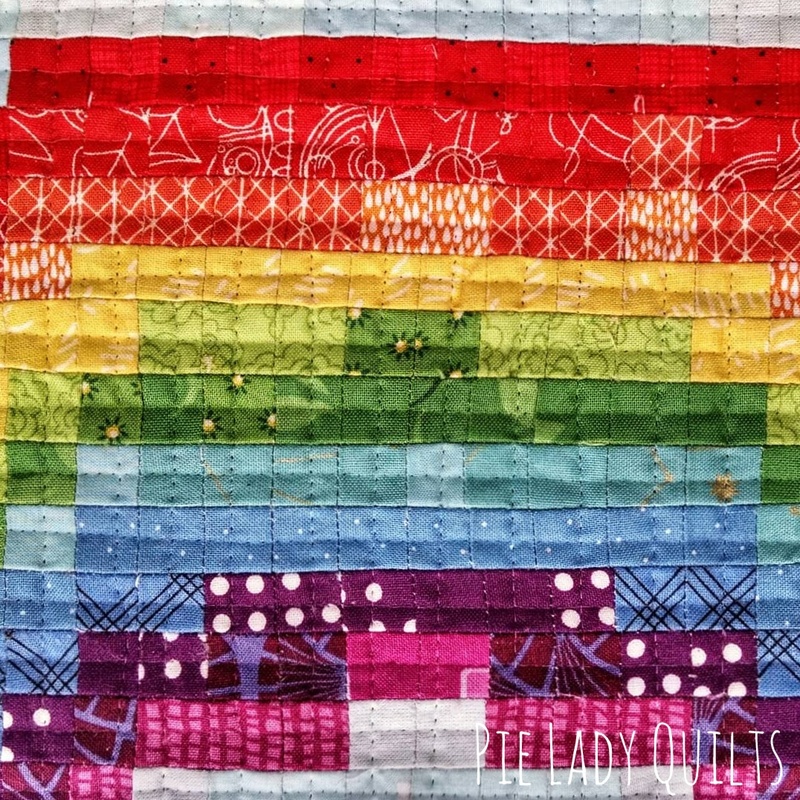 Mentally, I had to accept every element I added as part of the quilt and use future decisions to validate previous decisions. I was thinking about how quickly "time flies" when I went through the bin of jeans that were way too small for my boys. I used that as a theme and found a way to include flying geese and an hourglass block. 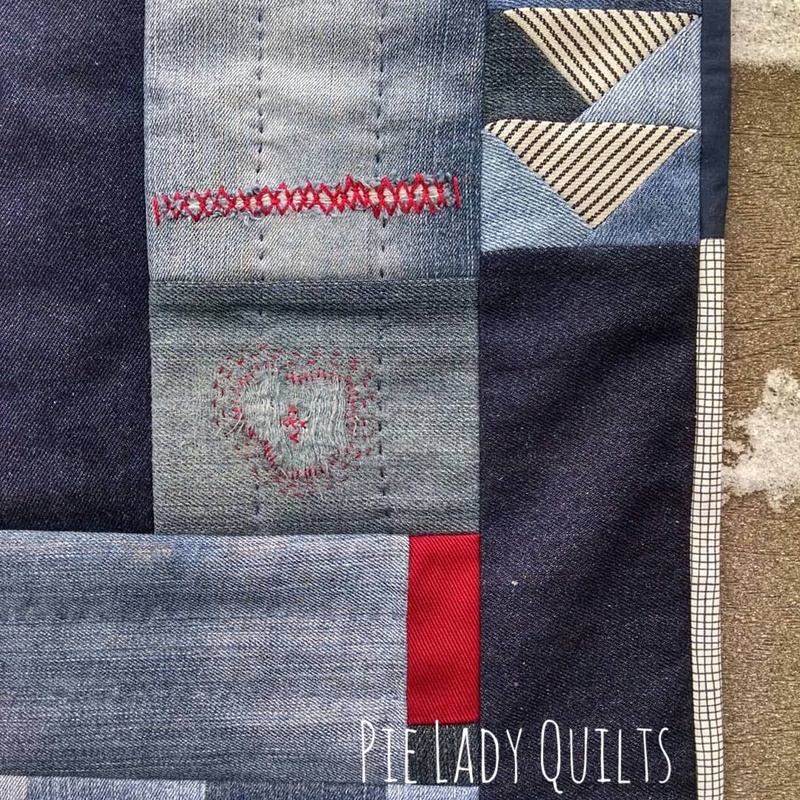 Before I began, I also tried to alter some of the jeans to add more variety to the quilt. I took some of the denim pieces up to my tub, laid over a gridded anti-slip rug liner, and sprayed them with diluted bleach. The effect is subtle, but I think gave the denim pieces a lovely texture. The two lighter pieces around the red in the center were treated in this way. I also added decorative mending in red. So many of the jeans in the pile had been previously mended and I thought it would be a fun memory. 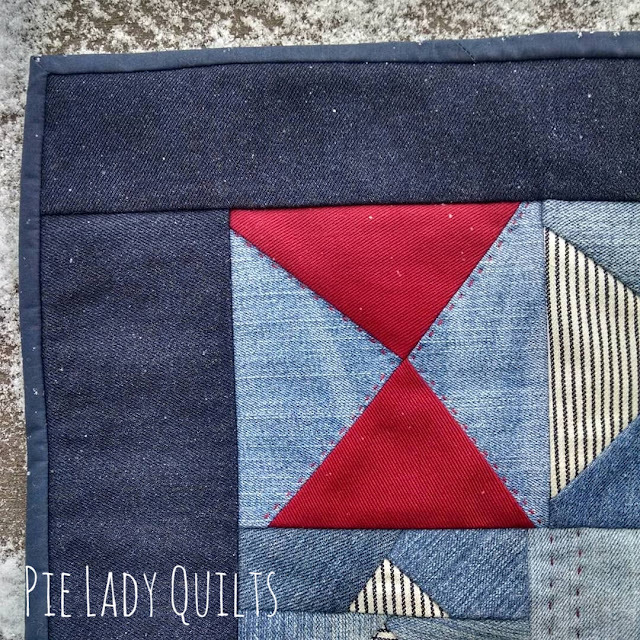 The red denim in this quilt came from my mother. I texted to ask her where she got it from and she told me that they used to be a pair of red pants that she LOVED from when she was teaching. Don't you love how it all comes full circle? The striped denim was a remnant that came in a scrap pack. "Time Flies," finished at 32" x 34." 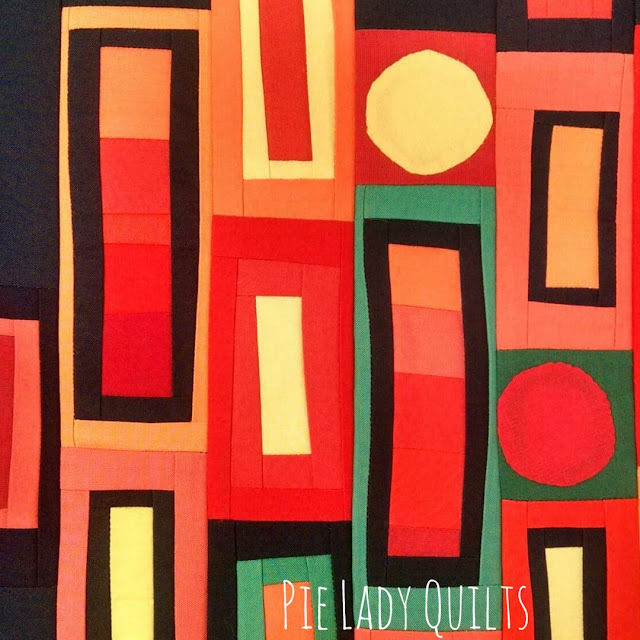 The next challenge for Project Quilting was "bigger than a bread box." Really, this was just a size challenge. You could make anything, as long as it was larger than 8" x 16." I struggled to get anything started for this because that really wasn't much of a limit. I decided to narrow the challenge even more and make the theme be bread. I studied the Wonder Bread label and found inspiration in the colorway and with the circles. I thought of history and "the greatest thing since sliced bread" idea. I started making "sliced" log cabin blocks and using needle-turn applique to make tiny circles. When I got worried about the colorway being a little too literal to the packaging, I added the coral and green that I already had out on my cutting mat from a Pantone project I've been working on intermittently. As I started placing the blocks on the design wall, I tried to keep the proportions of a loaf of bread. Finally, my last bready inspiration was to construct this in a quilt-as-you-go method. Each of the blocks was 2.5" wide, so I pieced blocks into rows and then added them to the quilt that way. It really emphasizes the idea of a slice. "Wonder" finishes at 23" x 37." The rainbow will be a gift for my daughter that is in kindergarten. I helped her with an art project a month ago for a contest sponsored by a local bank. Some of the prize winners have their work appear in a calendar and some have their art framed. She didn't win either of those prizes, but I made her a solemn promise that we'd frame her work no matter what happened. She made a rainbow. This is not a shocker because she colors rainbows on everything. No matter what she's studying at school--whales, printable books about snowmen, math papers--she turns it into rainbows. If there is an outline of any shape on a printed page, it is getting the rainbow treatment. For her project, I cut millions of tiny squares out of colored origami paper, and she glued them to her collage. At the end of her rainbow she wanted a cloud, so I found some white tissue paper with rainbow glitter in an old gift bag downstairs and she glued it in smushy swirls on the bottom. The whole project took forever. Afterwards, I pressed the cardstock we'd used between a huge stack of books, but there was so much glue that it will forever ripple. We're going to see her work in a show tomorrow and she's incredible excited. I'm sure you can see now why I made the rainbow and why I persevered when I was starting to hate every minute of it. Do you know the even crazier thing? 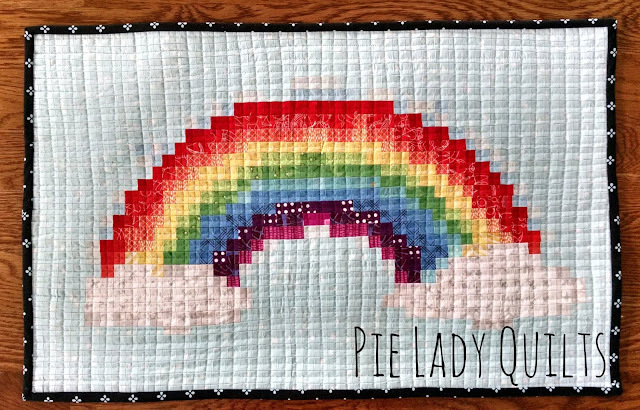 I told my mom about the rainbow I'd made (with no backstory) and she offered to send me money to have it framed! Full circle again! 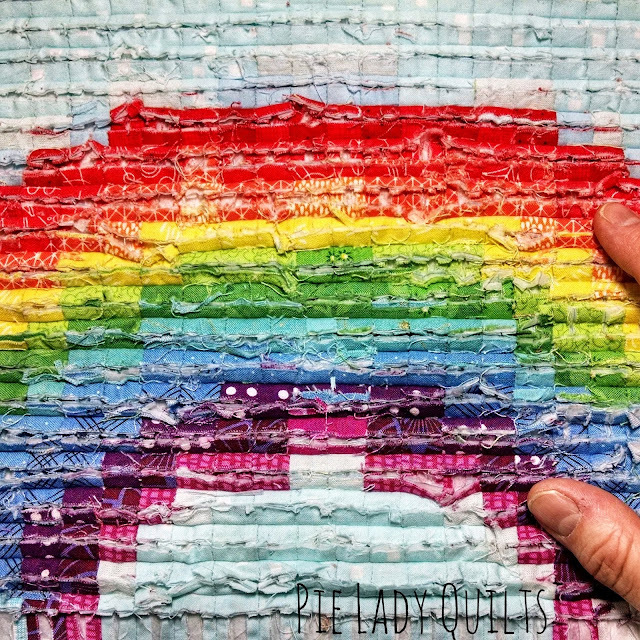 "Rainbow Lunacy" is 14" x 22." Remember that Heat n Bond that I bought? Yeah, I wanted to use that and I still had the idea of rainbows in my mind. I made four different sizes and shapes of rainbows and pieced them together to form a composition. Doing that art project with my daughter helped me remember how much I like collage. This was fun. I'd like to do it again. "Rainbow, 2," is 15" x 15." 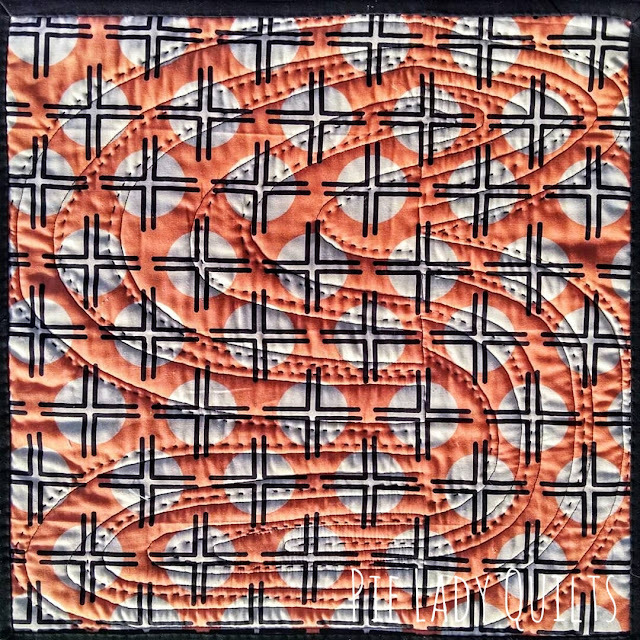 It is machine quilted and hand quilted. 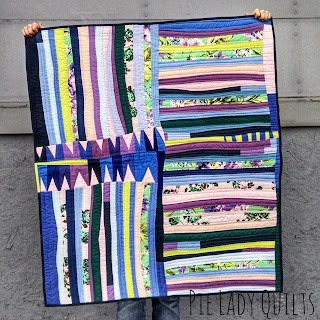 This is a quilt that I finished last summer, but it never really fit into a blog post until now. My little kindergarten daughter? She has a hard time sometimes because our two oldest boys are the best of friends and do everything together. It's helping now that Babyness is older and capable of more because the girls love to play together. This past summer there were times that she felt pretty left out. One Sunday afternoon, when she was really frustrated with her brothers, I brought up my bucket of snippets to do an activity with her. I keep a bucket on the shelf above my cutting table for snippets...pieces that are too big to just throw away, but too small to ever be found in the larger scrap bin. I asked my daughter to sort through them and pull out any pieces that felt like a warm color to her. She had a great time going through the whole bucket. The next morning I started piecing the little snippets she'd picked into improv log cabin blocks. I set them improvisationally and let the chocolate background ebb and flow through it. I called it "A Family Affair," and it is 30" x 30." 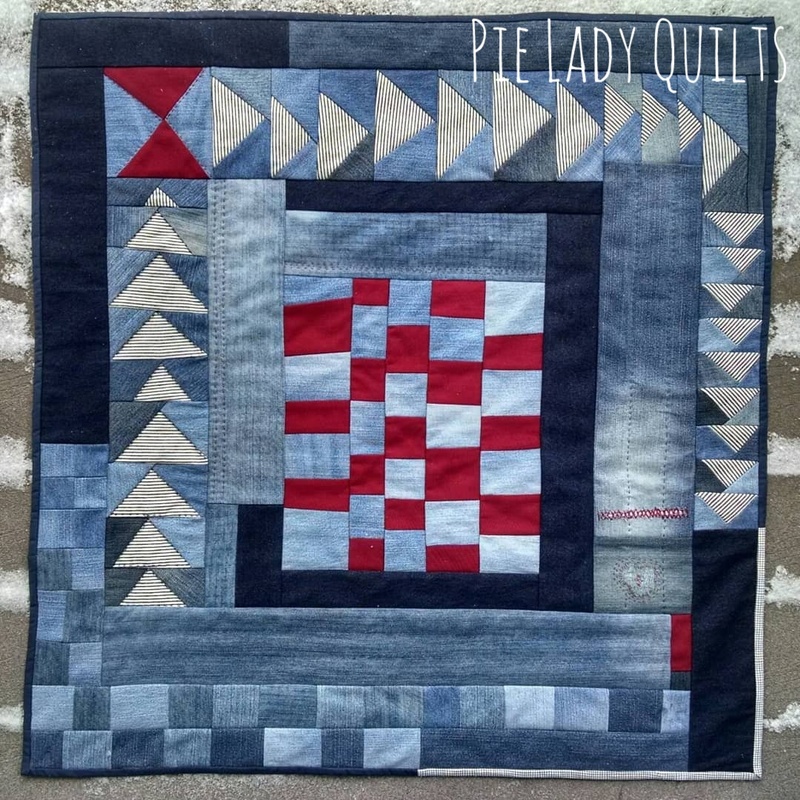 The last quilt I'd like to share is a trading game quilt. For those of you that don't know, I offer up items from my sewing room that I'm either not using or not interested in using any more to trade for scraps. I was looking for a mental break from the pressure of Project Quilting and picked up a bag of solid scraps I'd received from Julie this summer. The bag had lots of strips of blue, grey and purple solids of various shades and a remnant of a mauvey Kaffe Fassett print. I added strips of acid green, pink and one Amy Butler print. 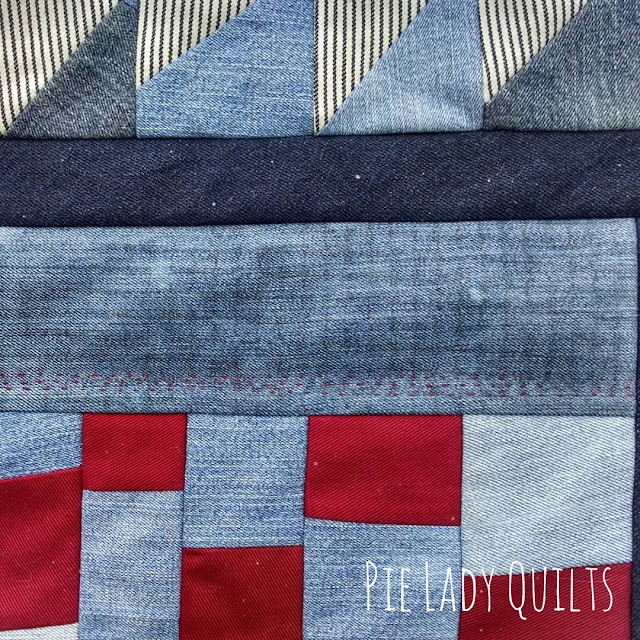 I had just taken the class from Sherri Lynn Wood on Creativebug and I was curious to try her ruler-free methods of strip piecing. I freehand cut things all the time, but there is always a point somewhere in the process where I square blocks or sections. I didn't this time. The orderly part of my brain wouldn't let me piece bubbles into the slabs, so every so often I would cut the next strip to match the natural curve happening. It helped ease in any fullness without using darts. I'm not a big fan of darts. 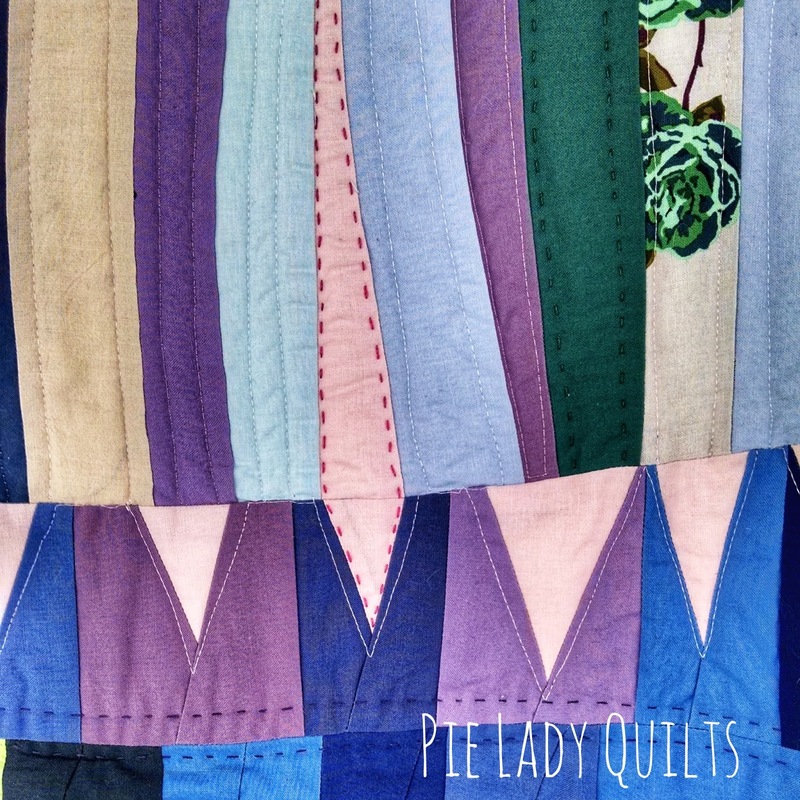 At the end of the process, I had four large slabs of strips pieced and no game plan. I didn't have to look far for inspiration. 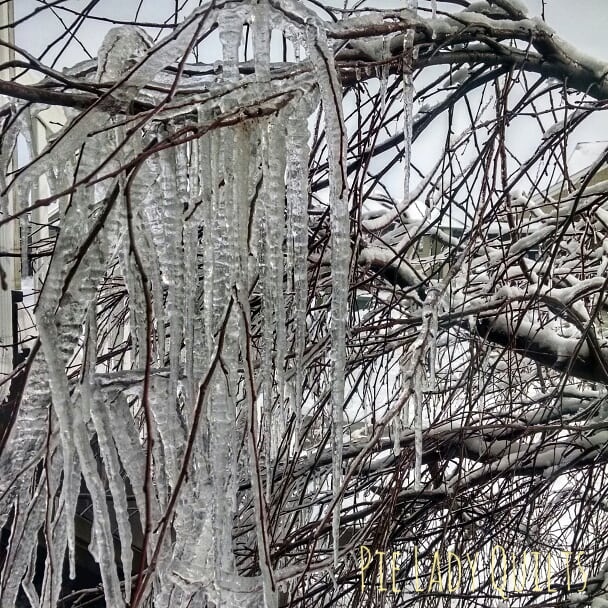 This picture was taken from my sewing room during one of the many snowstorms this winter. 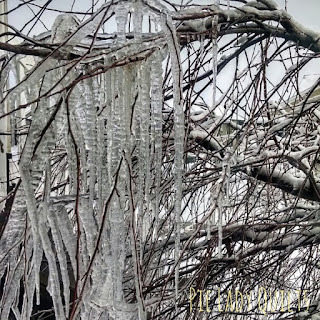 I used the bigger scraps from the bag to recreate icicles and make up a size differential I had. There was a place where a pink strip accidentally and EXACTLY matched one of the pink icicles. 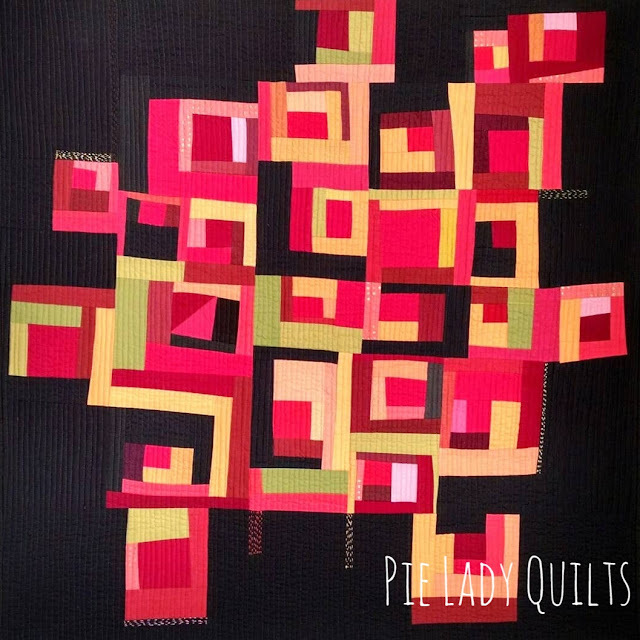 I hand quilted it in hot pink to draw the eye to that delightful bit of serendipity. "Icicles" finished at 42" x 47." 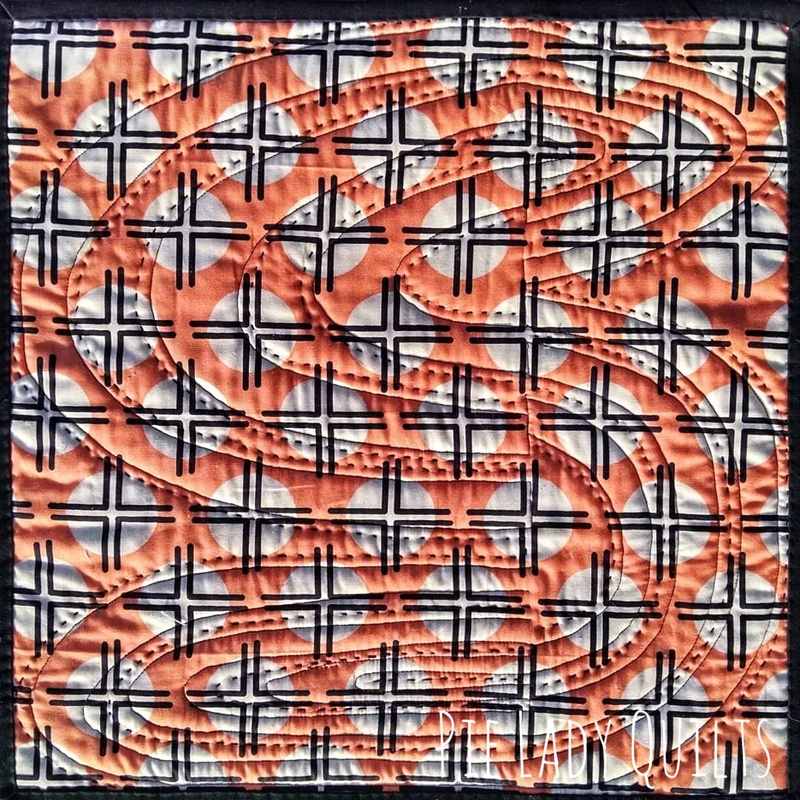 It is quilted with a mixture of hand and machine quilting. If you hadn't mentioned those were strips from our swap, I'm not sure I would have picked up on it - they look so different now! 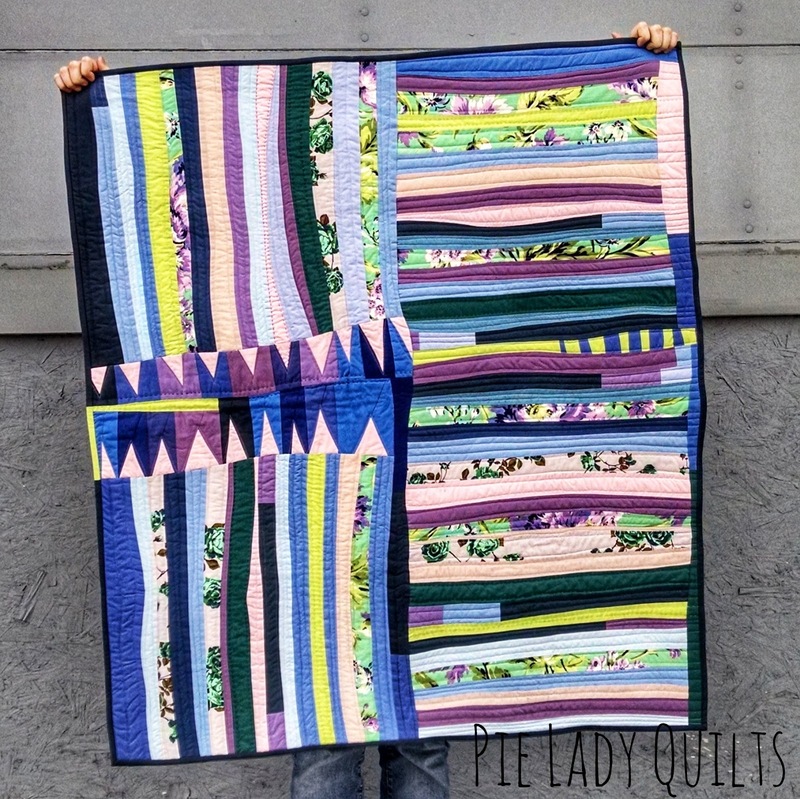 What a terrific post (I especially like the first quilt). I had to chuckle at your comment that complete unlimited creative freedom freezes you up. 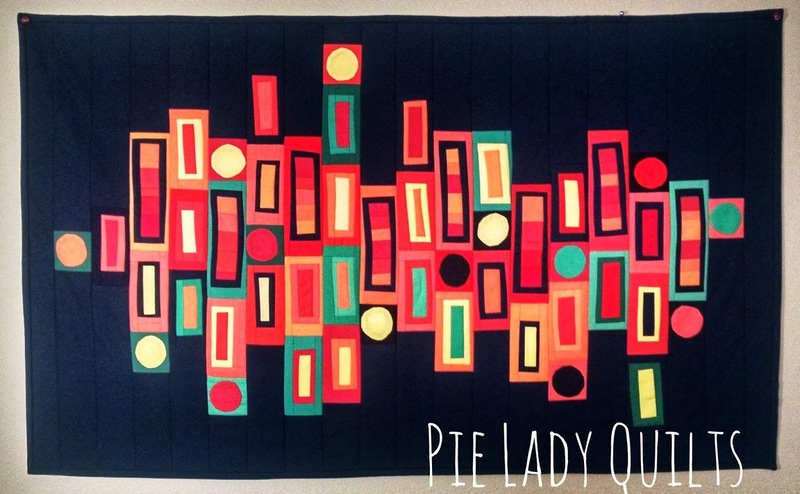 If I were going to describe much of your work, it would be free form, improvisational quilting. And I voted for your rainbow.